Here’s the post-game. Sorry it’s late but, as I mentioned, I was in Indiana all weekend. I’ll have a post a little later on more season level issues including Kelvin Grady and Manny Harris among other things. I learned that Manny Harris didn’t travel to Purdue when I was about an hour from West Lafayette (more on Harris’ suspension in a post later today) thanks a wave of text messages. It’s safe to say that I was disappointed but I was also a little bit curious to see how the team played without him. At the same time, I didn’t think Michigan had much of a chance with Harris playing, it would take a fool to think that they had a chance without him. The result was not surprising. 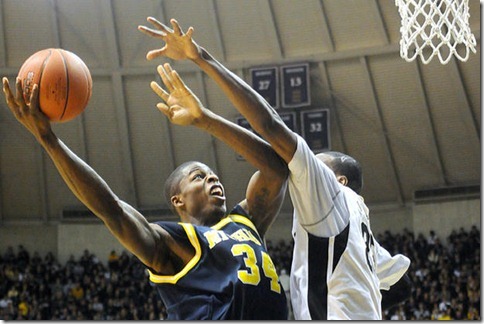 Michigan hung with Purdue for 7 minutes on the back of DeShawn Sims (Peedi’s starts to the last two games have been eerily similar to last years BTT game versus Iowa) and no one else, but Purdue eventually overwhelmed them. Purdue dominated for the middle 30 minutes and blew the top off the game. Michigan shot the ball well (eFG% of 53%, 41% 3pt) but they couldn’t hold onto the ball to save their lives. Michigan turned the ball over on a quarter of their possessions and when the game was still in doubt this number was even higher. Michigan’s guard play continues to be terrible and it’s the number one thing holding this team back. Stu Douglass played one of his worst games in a Michigan uniform, he turned the ball over four times and just seemed to look lifeless on the court. Morris also turned the ball over 4 times while Lucas-Perry added three. 11 turnovers from your three guards is simply not going to cut it. Despite Michigan’s offensive struggles, their defense was even worse. Purdue scored 1.13 points per possession for the game but it was much worse early on. Late in the first half Purdue was shooting over 60%, rebounding 60% of their misses, and scoring 1.55 points per possession. Purdue executed their offense to perfection but Michigan just had no match for Purdue’s big three. Robbie Hummel, E’Twaun Moore, and JaJuan Johnson got the shots that they wanted and made them. Michigan deserves credit for not quitting but that’s a bittersweet takeaway at best. They continued to fight in the second half and did manage to cut the deficit to only 10 points in the end. But it’s also clear that this game was never that close. Purdue looks to be rounding back into their early season form and they should be a force to be reckoned with down the stretch in the conference. DeShawn Sims: It was clear that Peedi wore down against Purdue but he continues to play extremely well: 21 points (8 of 18), 8 rebounds, and 1 assist. Sims continues to lead the conference in scoring (conf. games only) and is playing well. He didn’t shoot it well today but he was dominant for the first 7 minutes when it looked like no one else on Michigan’s team even wanted to play. Zack Novak: It was nice to see Novak hit some shots even if several of them came when the game was essentially over: 16 points, 5 rebounds, 2 assists. Hopefully Novak can keep it up because Michigan is going to need him to hit some shots Tuesday. Stu Douglass: Terrible game. Terrible defensively, terrible offensively. Michigan needs more from Douglass and this wasn’t it. Whether it was forced threes, strange shots in the lane, sloppy turnovers, or forced passes, none of it was pretty. Laval Lucas-Perry: Laval also had his share of turnovers (3) but I didn’t think he was all that bad. He’s not going to take the game over but if he can be efficient and hit his open shots (2 of 2) and get to the line (one of only three players to attempt a free throw) he can give this team a boost. Darius Morris: If only he could shoot. There’s a lot to like about Darius but he just can’t shoot, from anywhere on the court, right now. Matt Vogrich: It’s all about next year for Vogrich. Chances like this give him a chance to get his feet wet but I think we will see a big jump out of Vogrich from year 1 to year 2 similar to many other Beilein players at West Virginia. The shot is pure (as seen in his buzzer beating jumper) and he just needs to continue to get more comfortable with the rest of his game at this level. Anthony Wright: Got the start for Manny and he did manage to pull down 5 rebounds and hit a three. Ant played hard but it’s going to be tough for Michigan to win games with him starting at the wing, he is always going to be a mismatch. Zack Gibson: If he hadn’t attempted a shot he would have been an honorary member of Club Trillion.